Kumeido – The Mendocino Zen Center is a Soto Zen practice center in the lineage of Reverend Gengo Akiba Roshi, Sokan/Bishop for Sotoshu International for North America. Akiba Roshi blessed Kumeido with its name. KU means emptiness. MEI means radiating light. DO means place. One look at the meadows surrounding the temple and you will see its spaciousness and the way the sun illumines and warms the earth and grasses, even on a foggy Mendocino day. Kumeido is dedicated to the practice of Zazen… “just sitting.” We sit with confidence that our original nature will manifest and guide us. Beginning on Saturday, April 20th, 2019, Kumeido will offer four, quarterly events to give the community a taste of Buddhist philosophy, teachings and practice. Community Dharma Days will be held on the 3rd Saturdays of January, April, July and October from 1:30 pm to 5pm at the Kumeido Zendo in Little River. On these afternoons we will explore together the basic foundation of Buddhism and its relevance in our current time and culture. Enlightenment: Work, Wake, Stay Woke! We have two wonderful Tenzos (cooks) for our retreat, a true vegetarian master and a pastry chef. Chef James Hardenburg and Pastry Chef Lyn Hardenburg. Yes, enlightenment can be delicious! For the daily sesshin schedule and other information, please click below. There will be other sesshins throughout 2019. Some will be half-day or day-long retreats held on Saturdays. Others will be multi-day retreats. The full schedule will be posted in the new year. Join us. In support of a meditator’s individual practice, Kumeido offers Dokusan - the opportunity to meet regularly with a teacher. The Japanese word “dokusan” means “going alone to a respected one.” Both our head teacher and occasional visiting teachers will be available for these scheduled meetings. When you come to Kumeido, please inquire about this opportunity. If you have any questions please send us an email and we will get back to you. Rev. Ann Myosho Kyle Brown is a Soto Zen Priest and disciple of Rev. Gengo Akiba Roshi. 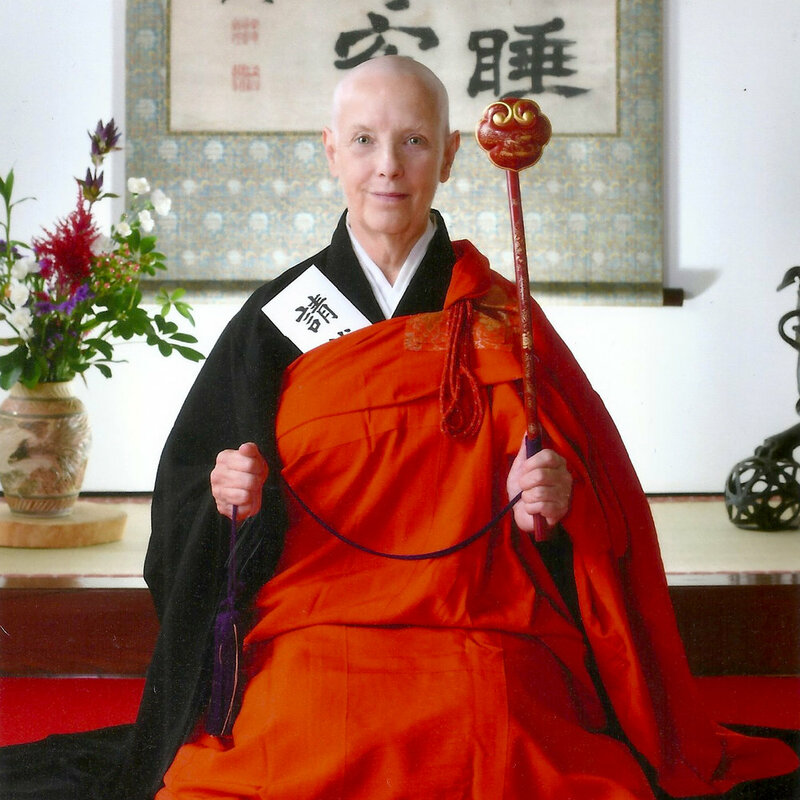 She is founder and head teacher of Kumeido – The Mendocino Zen Center. She began Buddhist practice with Akiba Roshi in 1992 at Kojinan – The Oakland Zen Center. Her early training was at Aichi Senmon Nisodo in Nagoya, Japan with Reverend Aoyama Shundo Roshi. Further training took place at an International Ango (training Period) at Yokoji Zen Mountain Center in the San Jacinto Mountains of Southern California with Rev. Akiba Roshi, and training monks from Eiheiji, Sojiji and Aichi Senmon Nisodo. In addition, she has practiced extensively at Genjoji, the Sonoma Mountain Zen Center with Rev. Kwong Roshi as well as other retreat centers throughout California, the US, Europe and South America. Rev. Myosho went back to Japan in 2015 for the Zuise Ceremony at Eiheiji and Sojiji, the two main temples for Soto Zen in Japan. After zuise one becomes an Oshō, i.e. "priest" or "teacher". In addition to her dedication to Kumeido, she works to support the development of Tenpyozan Monastery in Lake County, CA. Tenpyozan is an important international training center for western Soto Zen priests and the first of its kind outside of Japan. Rev. Myosho is also a writer, wife and mother. Practicing Buddhism is very different from simply studying Buddhism in books. Practice and study are like two friends, hands joined, walking together on the path. But practice is leading the way. When people sit together they naturally become bonded. This mutual support and shared journey is a profound connection. An individual’s strong practice inspires the whole sangha. The efforts of the whole sangha support each individual’s practice. Still, whenever people come together there are differences that can create conflict. Aoyama Roshi says that, “training together is like stones in a tumbler. All the rough edges get smoothed out.” Come join us. Originally founded in the barn on her home property in 2002, Reverend Myosho Ann Kyle Brown has shepherded Kumeido through many separate incarnations over the years. The barn was initially dedicated as a sacred space by ministers from many other religious denominations on the North Coast of Mendocino. As a newly ordained and trained monk… Reverend Myosho, though not yet fully credentialed as a teacher, still wanted to offer the dharma to the community. At the beginning, practice was quiet…one by one or two by two, people were drawn to come meditate. Some stayed, some were passing through, some came during times of deep grief or change, then returned to their original religious affiliations, buoyed by contact with the dharma teachings. For many people, a Zendo is not a destination point; it is a wayfarer’s refuge on the way. A few years back, Rev. Myosho stepped back from her role as head teacher and closed Kumeido to refocus on her solo practice. During this time she returned to Japan to complete her training. Kumeido now reopens for its next incarnation on December 3, 2018 for a six day Rohatsu Sesshin. In May of 2016, Kumeido received a bequest from the trusts of Terry Lyon and James Cook, the very first practitioners to enter the Zendo in the cold early morning hours of the very first day of its existence in 2002. Now, these many years later, their generous donations to Kumeido and the Soto Zen tradition of Buddhism, as well as to Three Jewels and the Thai Forest Tradition enable these two traditions to deeply root on the North Coast. Terry and James are the reason Kumeido is able to reopen its doors again. In keeping with the tradition of Kumeido from it’s beginning, we have never charged for any event or practice opportunity. We shall continue with this tradition. Can you help us to do so. If you are able to make a contribution, no matter the size, you can be confident that your support will be a protected dharma asset. Every donation works to institutionalize Kumeido; offer everyone who is interested a chance to touch the dharma; and in time, securely transplant Kumeido onto its own strong foundation on an independent property on the North Coast.